What is the Student Attainment Project? Within higher education there is long-standing evidence of a noticeable gap in the attainment figures between Black, Minority Ethnic (BME) students and other students. Put crudely, students who come from BME backgrounds tend to be less likely to get good degree outcomes. Worryingly, the research has shown that this gap exists independently of prior academic performance. Why should this be the case? There has been extensive academic research conducted into the reasons for this. The only common factor between all the studies is the confirmation that there is no single reason for this attainment gap, and thus no ‘magic bullet’ – no single solution. The absence of an easy answer risks meaning that we fail to address the problem. The University of Derby has always been committed to opening up opportunity for all students. The attainment gap offends against those values of equality of opportunity for every part of our student body. For that reason, the university put in place the Student Attainment Project to work to completely remove the attainment gap. The project draws on experiences from across the sector. Our work with other universities suggested that the most successful outcomes were those that worked incrementally – a range of different interventions, each of which targets a particular hurdle which HE may represent for a group of students. Through this broadly inclusive approach, the project has aimed to enhance the learning experience for all students – and by doing so to remove the attainment gap. This commitment to inclusivity has another important aspect – it ensures that in addressing the attainment we do not inadvertently stigmatise particular groups of students, or put in place negative expectations about performance which may reinforce disadvantage. What is this Press Pack? This ‘recipe book’ has been designed as a resource pack for tutors to use with students to help them raise their game. It is a “pick and mix” selection of activities, advice and guidance. Each of the ‘recipes’ has been proven to have a positive impact on student attainment, especially with those students who may be first in family into Higher Education or who come from a BME background. 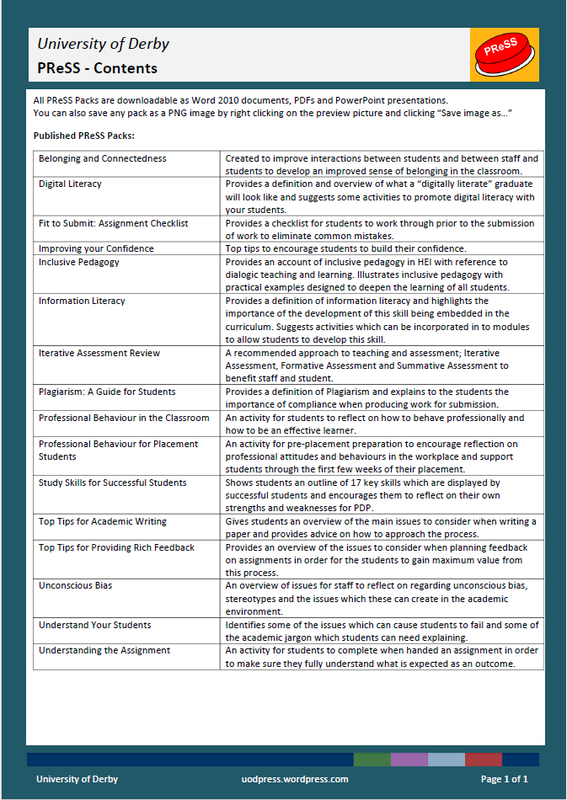 Many of you will already be taking some of these approaches in your pedagogy but we hope you may also find something in here which is new to you. How to use these recipe cards – as with any recipe you may need occasionally to substitute one ingredient for another to suit your taste and your pocket. It is important to see each recipe card as a template for you to follow which you should adjust to suit your students and your subject matter. Each approach has been distilled into one side of A4 for ease of use and reference. You should be able to flick through and pick out what you feel would work with your students and tailor it to suit. We are adding to the recipe book all the time – if you have something to offer do get in touch. Also, please give us any feedback from yourself and your students so that we can continue to develop the resource. Contact Student Experience Project Manager: Helen Hathaway; email: h.hathaway@derby.ac.uk; phone: 01332 593676. For more information about the project and the team, click here. To view useful resources and the project bibliography, click here. For a quick overview of the contents, click the image below. What Makes a Successful Student?